A recent survey of PhDs found that many researchers feel that they lack formal training in a variety of transferable skills. At Addgene we've set out to fill this gap by both highlighting that researchers do learn MANY transferable skills while working in the lab and by offering advice on areas where you might need some help. 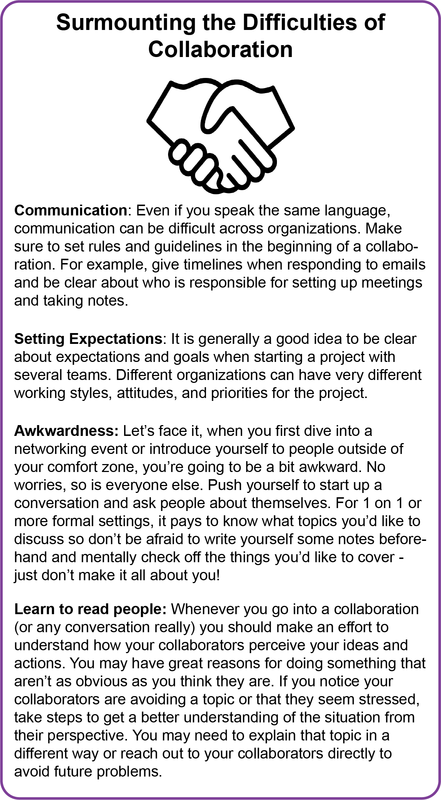 Today in our transferable skills guide: Collaborating with others outside your organization also known as external collaborations. Interestingly, the ability to work with others outside one’s organization was found in the aforementioned survey as one of the the skills favored by research-intensive careers. External collaborations are becoming increasingly important as more complex approaches to scientific questions become popular. There are only so many methods and machines one team can learn so linking together expert teams can push a scientific project to the next level. External collaborations and partnerships are also very important in a non-research context, especially when considering small to mid-sized companies and organizations. Addgene as a nonprofit organization is very considerate and thoughtful about its limited resources. Rather than developing entire new teams in house to solve every problem (although we do that too), we will often look for partnerships where we can leverage another organization’s expertise to our mutual benefit. Our partnership with SnapGene, for example, allows us to display high-quality maps and annotations without us having to invest too much of our internal software development resources into it. At the same time, this project gives Snapgene great exposure to the community of biological scientists who use Addgene everyday. To get this and other projects like it going, someone (likely several people at Addgene) had to take the initiative to find a suitable partner, connect the relevant teams, coordinate implementation, and now must focus on managing the established partnership. If you’re willing to do similar things for your team or lab, you’re likely to be seen as a huge asset! As is true for any skill, there is a learning curve for collaborating and it is always a good idea to start close to your comfort zone and slowly expand from there. As part of my position at Addgene I am now involved in Strategic Partnership Management, a very interesting and exciting part of my work. However, this is not the first time I’ve had a role in organizing collaborations. During my graduate studies at Karolinska Institutet I started working with other groups. First within my department where we shared materials and equipment between labs. Later I worked with people outside the department to accomplish a variety of goals. For example, I worked with some microscopy enthusiasts to start a microscopy seminar to connect the imaging community and to create a platform for discussions and potential collaborations. We invited experts from other universities and maintained a mailing list. This project gave me practice reaching out to other scientists, being clear about what was expected, and keeping track of speakers. During your graduate or postdoctoral work there are loads of opportunities to create communities, platforms, and to be a part of projects that connect people and make you work in a collaborative environment. Think of student groups, PostDoc associations and specific projects where you share methods and equipment between lab groups and departments. You don’t have to get these types of projects and groups going alone - if you are aware of a problem or a need for something, usually someone else has realized this too. Begin with informal conversations about your ideas and don’t be afraid to make something concrete happen. You may have more willing collaborators than you realize. Being at a university provides the perfect platform for practicing initiative and for training in teamwork and collaboration management. For example, you may already be part of a scientific collaboration - show initiative and start organizing meetings and take minutes. Get to know your collaborators from other institutions personally on conference calls and make sure to maintain these relationships by keeping in touch by email and social media (see the section on “Maintaining Relationships” below). The next step is to expand your efforts beyond your organization and/or scientific field. Reaching out to people who have little in common with you is much harder than starting a collaboration with a colleague. However, reaching outside your knowledge sphere allows you to connect with experts that complement your (scientific) skill set and is therefore very useful for complex projects. It is also fun! I really enjoy learning from others and meeting people with different mindsets and approaches can truly broaden your mind. When I first began collaborating with people outside my lab’s department, I personally felt that I had to overcome some hesitation to ‘approach strangers’ and learn how to communicate outside my scientific expertise. Organizing a career fair for early-career scientists provided a crash course in this discipline. Getting companies to come to these types of events can be very tough. First I needed to find the right contacts at the companies and then convince the contacts to give me some time to talk or to at least read my emails. Then pitching myself and the event was very difficult and somewhat awkward in the beginning. But, as so often happens, one gets better with repetition. I learned to look at the event from the company’s perspective, focus on the message and to keep it short. Soon, discussing with strangers stopped feeling weird and started to be fun. I just had to remember to approach the relationship with the perspective of my potential collaborators in mind. Being at a university allows you to approach people outside the university within the context of learning and, in my experience, mistakes and insecurities are more easily excused. When you reach out as a student, people tend to respond in a supportive way and are willing to help because you are not (yet) asking for a job or a big favor - you are generally asking for some advice and guidance. The relationships you establish in this way can, of course, lead to jobs and even favors, but you should not go into a professional relationship expecting these things. In this context, I often found people outside my university approachable, friendly, and helpful. Finally, don’t forget about collaborations and projects you can do with others after work. Get sponsors for a training weekend for a sports club, find speakers for a meetup or recruit volunteers for your local animal shelter. There are many opportunities so just pick the one that you feel enthusiastic about and get started. You never know where the relationships you develop will lead! Great progress! You are collaborating with your neighboring lab, you've met interesting people at conferences and you have successfully reached out to people outside your organization. Now comes the hard part: maintaining these relationships. Personally, I find this to be the most challenging and time-intensive part of relationship building. However, it is essential when aiming for long-term projects, collaborations and partnerships. There are many different ways to maintain a relationship - many of them involve personal meetings and common interest so naturally this may be easier to accomplish with people at your organization. You can meet collaborators for lunch, make a point of talking to them at a seminars, or even set up regular meetings. Meeting people outside your organization just to have a quick chat can be rather tricky (think people based in different countries). Here social media is a connector and virtual meeting place: You can follow interesting people on twitter and maintain a connection by commenting and sharing. LinkedIn or ResearchGate allow you to send personal updates as messages and keep you up-to-date on your collaborators’ professional developments without directly contacting them. One great way to transition from an internal to an external connection is to make sure you keep open lines of communication with colleagues who move on to new organizations. Keeping in touch with your old lab mate may just land you a job someday. Universities themselves can help you do this through practical tools like alumni networks. I find it useful to remind myself to check in regularly with collaborators for example on a holiday or for professional updates. Whenever I see interesting events, articles and newsletters I make sure to share them with a short note - this creates a thoughtful way of interacting and is much more effective than simply sending a message asking how things are going. Science careers where the ability to start and maintain external collaborations is important? In my current job at Addgene I work with people from various organizations in science and beyond. For example, I help organize scientific workshops, manage conference attendance, and I scout for potential business partners. I am glad that I was able to build experience during my graduate studies in regard to reaching out to new people, checking in regularly, and maintaining useful notes that remind me about the current state of a partnership. Every collaboration and partnership is different as are the individuals that are part of them. I’m delighted that these collaborations give me opportunities for continuous learning and growth through my interactions with many different types of people. As mentioned in the beginning, the ability to work with others outside your organization is important for success in research-intensive careers. In addition, this skill is a hallmark for jobs focusing on: Science Policy, Business Development, Administration and Intellectual Property (Sinche et al 2017). So if you enjoy taking initiative, connecting with others, and organizing collaborations, keep these jobs in mind! 1. Sinche, Melanie, et al. "An evidence-based evaluation of transferrable skills and job satisfaction for science PhDs." PloS one 12.9 (2017): e0185023. PubMed PMID: 28931079. PubMed Central PMCID: PMC5607200.